"Hatch chiles are in season for only 8 weeks a year, 10 weeks if the weather is extra warm. Our local markets roast and sell them in 25-lb boxes. We buy 50 lbs every year, package them, and freeze them. 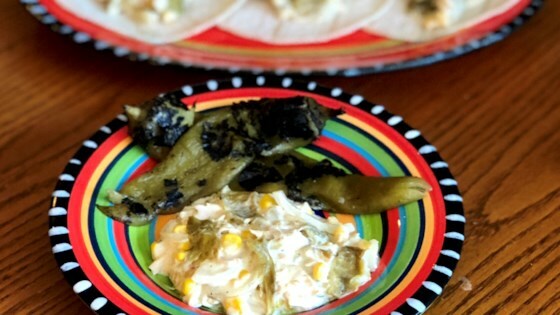 This flavorful recipe can be served in tortillas, over rice, or by itself." Place Hatch chiles directly on the grates of a gas stove. Cook over medium heat, flipping with tongs occasionally, until blackened and charred, about 5 minutes. Place in a sealed plastic bag and allow to cool, 7 to 8 minutes. Peel off charred skins, remove seeds, and cut flesh into 1-inch squares. Melt butter in a pan and saute onion until translucent, about 5 minutes. Stir in corn. Add chiles and sprinkle with chicken bouillon granules and pepper. Stir until well combined. Add chicken and crema; simmer until heated through, about 5 minutes. Creme fraiche can be used in place of Mexican crema. Delicious! We made street tacos with it and loved them. Just needed to add a little salt. Delicious and fast! Two chiles was plenty for our kid-friendly family. This will be one of my go to recipes. I followed the recipe exactly, and it was delicious! My wife and daughter loved. Easy to make when you prepare the peppers ahead of time.